This elegant, striking model was featured by Dubois at the 2014 Monaco Yacht Show. Described as a ‘beast’, the progressive design of the Dubois yacht features dramatic lines and crisp shapes for speed and power, as well as relaxing accommodations below deck, including a gym and library. 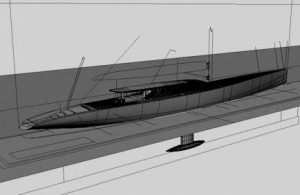 It will be constructed by Dutch shipyard Royal Huisman with a projected Spring 2017 completion date. Wanting to incorporate this same combination of strength and luxury in our model was a key factor in our choice of materials and processes. We used a combination of CNC techniques, hand skills and advanced paint finishing systems to create the model, being conscious of reflective surfaces and quality of line in our approach from the outset. We took great care in the distinctive surface finish on the hull, being a semi-metallic satin with rich layers of colour and lacquer for depth. The decking is represented with laser-engraved hardwood veneer, and the mast and boom fixings are a compound arrangement of brass and aluminium for strength and machined precision. Successive layers of hand-polished paint and lacquer went into recreating the molded glass superstructure as a continuous unbroken surface. 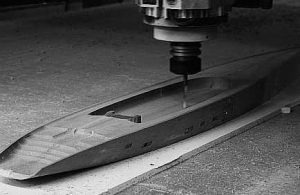 We were able to utilise the keel as a reinforced support on the welded steel base, giving the appearance of a model perfectly balanced upon the polished metalwork base with no additional standoffs. 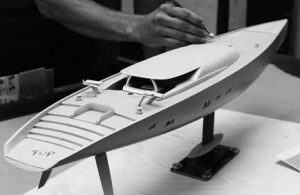 The model can be seen in a number of online publications, including this article by Megayacht News.